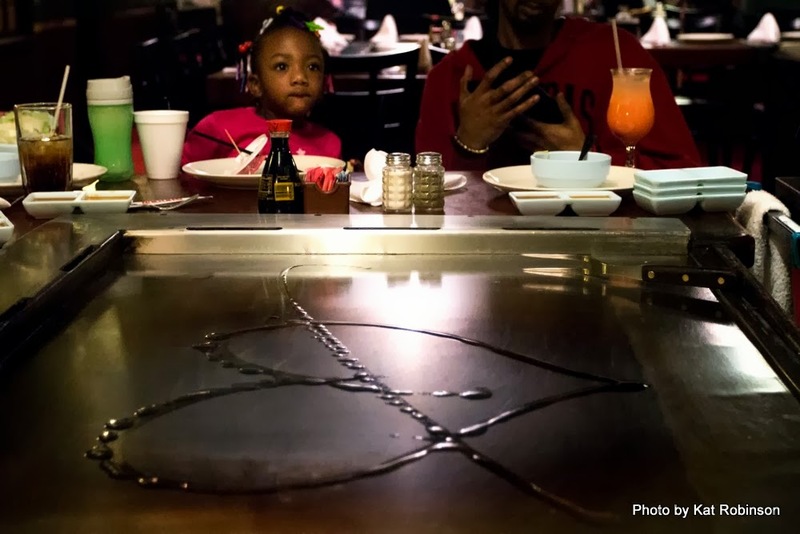 Shogun, Arkansas's Oldest Japanese Steakhouse, Still Captivates. This restaurant closed in 2017. 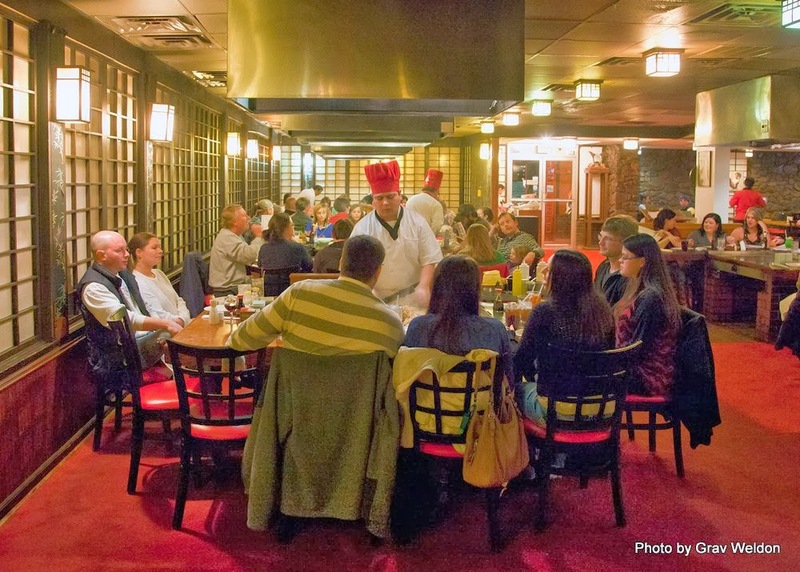 Arkansas’s oldest Japanese steakhouse opened its doors in 1982. 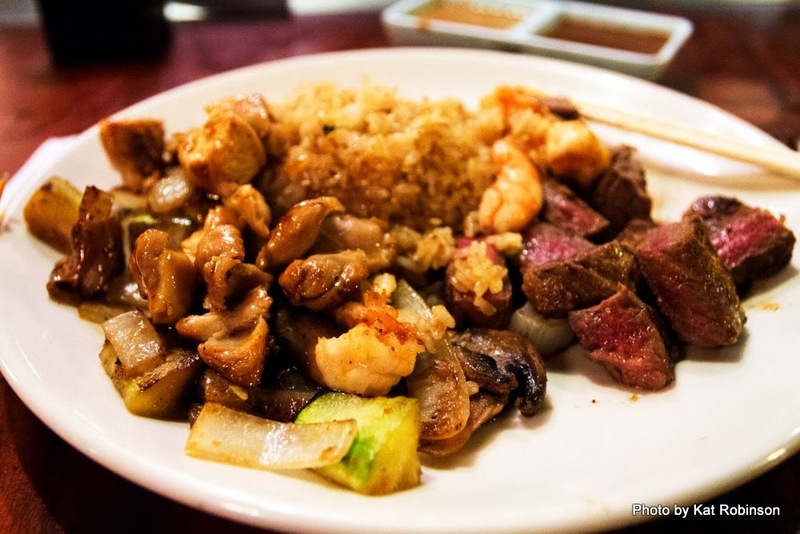 Today Shogun has a lot of clones here and there, but it’s still doing a steady job of serving consistently good food and delighting diners. 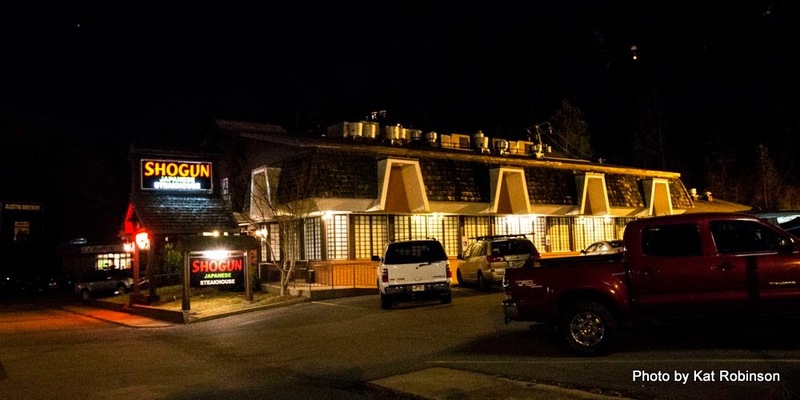 A lot of cities have their own version of Shogun, but this one isn’t a chain – even though it did open its doors within a building quickly vacated by another chain which has its own place in Arkansas restaurant history. That would be Sambo’s. There were several in Arkansas, including one in Fort Smith’s Central Mall and spots in both Little Rock and North Little Rock. All locations save one (the original) closed in 1982. If you look closely at the Googie-designed building today, you can see remnants of the Sambo’s that came before it – in its arched windows and the distinctive handles on the front door. But the windows have long since been replaced with Japanese-style translucent gridded screens, and a Japanese-styled pavilion has been added to the front. 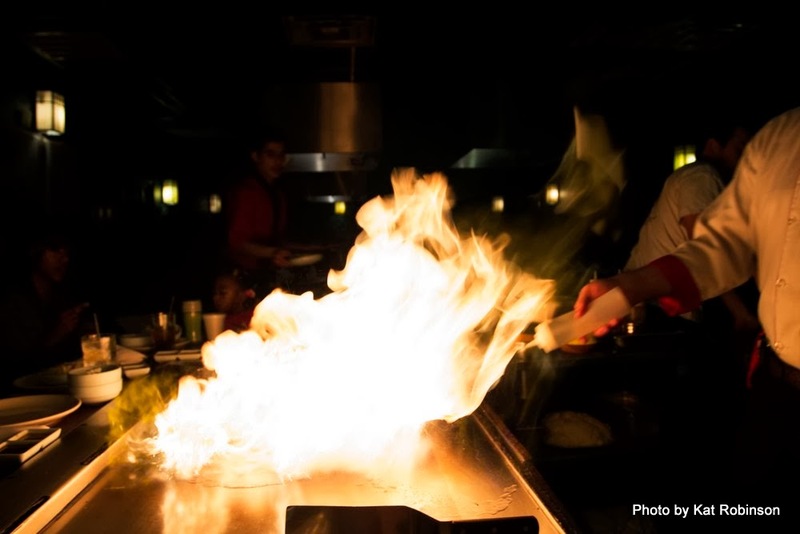 Shogun’s a place that’s lived long in my memory – a magical restaurant where chefs conjure images with fire and oil, and beverages are consumed from ceramic vessels of warriors and Buddhas. But my last visit more than a dozen years ago had been met with tired wallpaper, yellowed ceiling tiles and decades of slightly burned rice embedded in the scent that embraced me when I entered the doors. 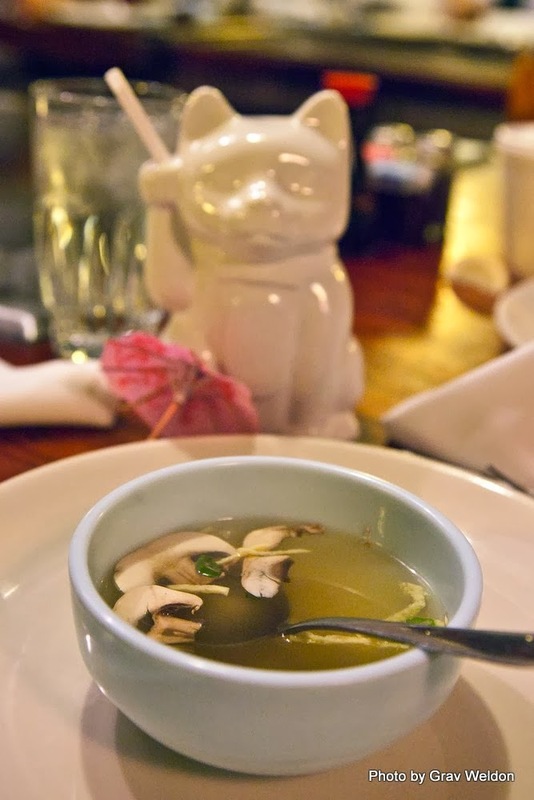 It wasn’t until my restaurant research brought me to the subject of Sambo’s that I decided a new visit to Shogun was in order, and boy was I glad I returned. The occasion? 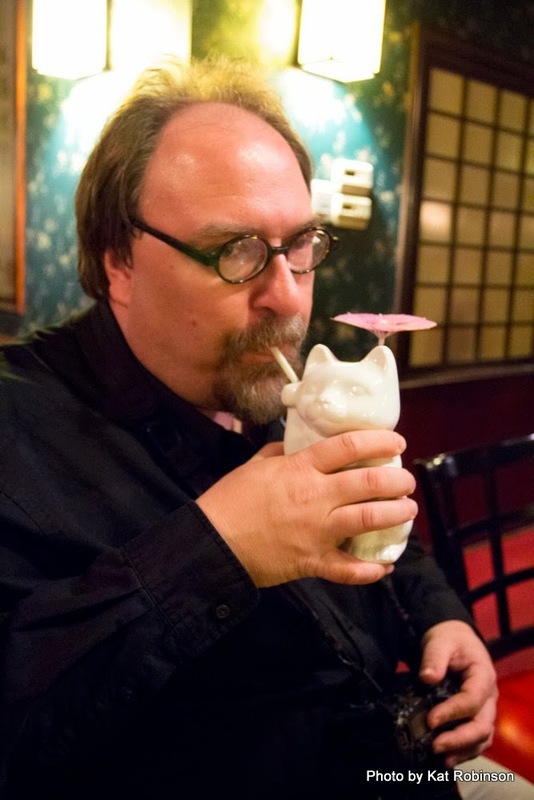 Photographer Grav Weldon’s birthday and the idea of drinking a beverage from a Lucky Cat. I kid you not. 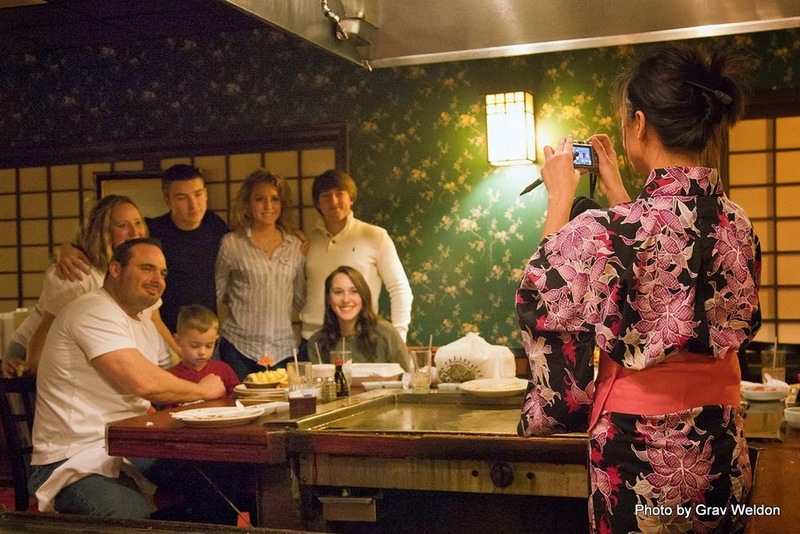 Kimono-clad waitresses will show you to your seat. We journeyed there on a Saturday night, me under the idea that the tired restaurant I had visited last would have few patrons. In this, I erred. There wasn’t a place to park at the restaurant, or next door at the garage or on the other side at Rack’Em Sports Bar. In fact, we considered ditching the idea until we saw there was no wait, and I parked the car over at the local Fabulous Finds Antique Mall. 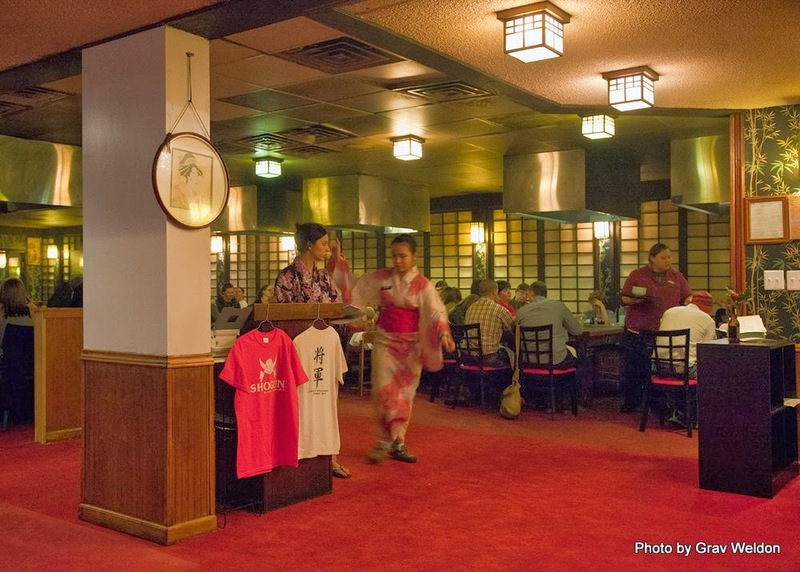 We were taken by a kimono-clad waitress back past the renovated sushi bar area and the teppanyaki tables at the front and through the hall to the back room, where three sets of two connecting tables held larger parties. We were seated with two other families at a table where, on the other side, the chef had just arrived to begin serving a birthday party. Across the room, a very large party had also come in to sit, consisting of what appeared to be 20 young men and women. Note the availability to be "cherished" for $6 in the black box. 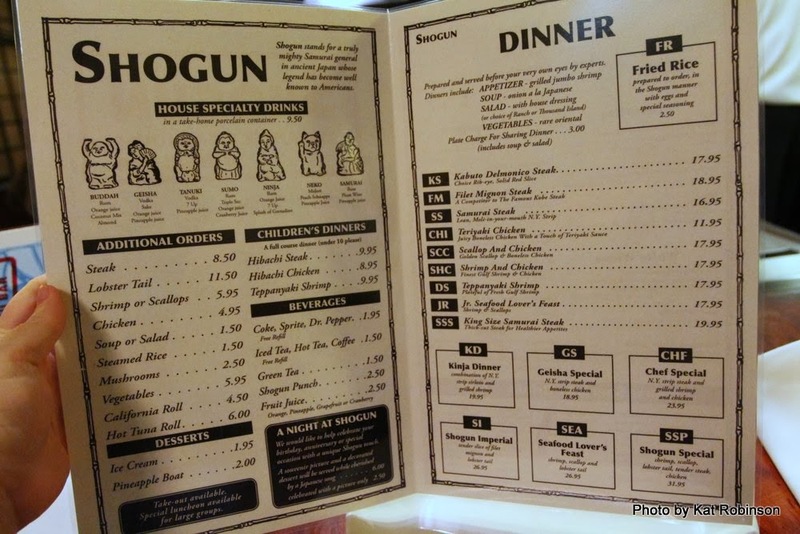 The menu has changed little since the early days, except now it’s a laminated bi-fold rather than the old faux-leather-clad paper version from before. 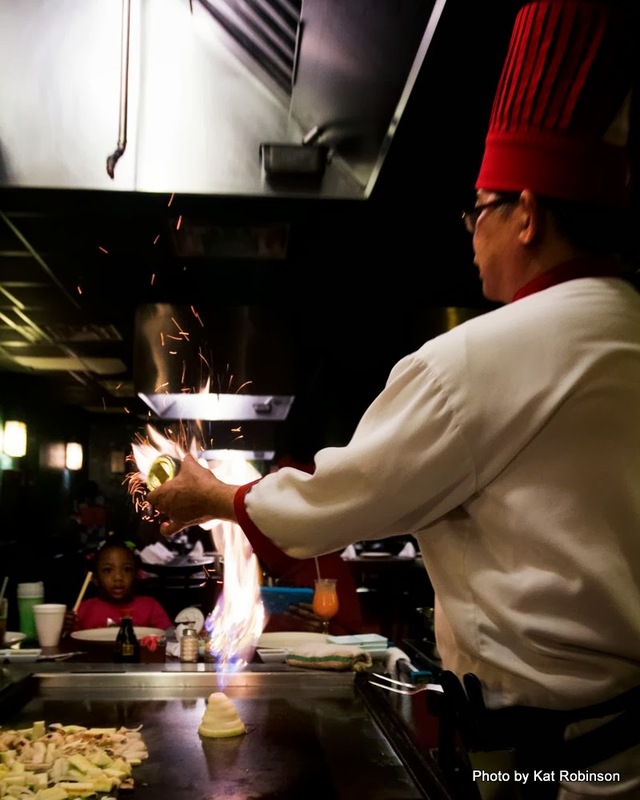 The prices haven’t changed much, either – with Teppanyaki Chicken on the low side at $11.95 and the Shogun Special being $31.95. Fried rice is still $2.50 extra, and there’s a $3 shared plate price – which, for a budget-conscious couple, is a great idea (the $3 goes for the separate soup-and-salad set-up). 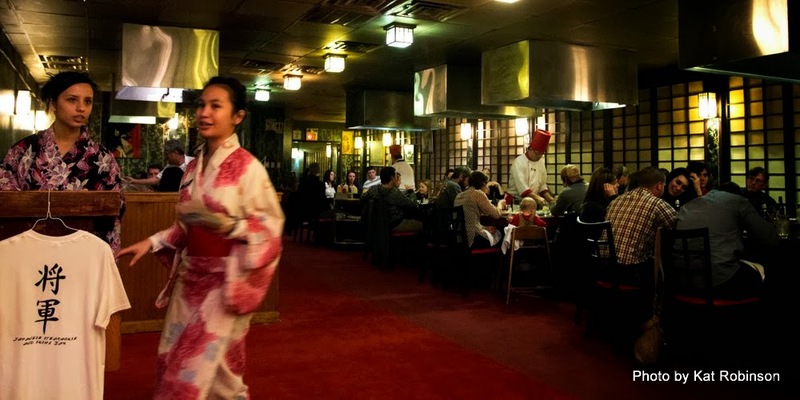 Before we even decided on our dinners, drums sounded, and kimono-clad ladies and chef-jacketed men came striding in with a bowl in front of them. They went to the table in the middle of the room, placed the bowl in front of one of the young men there and sang a tune, all while clapping hands and beating the drum. The dessert presented, they bowed and returned to from where they came, and hoots and hollers rose up from the celebrations. Ah, a birthday party. 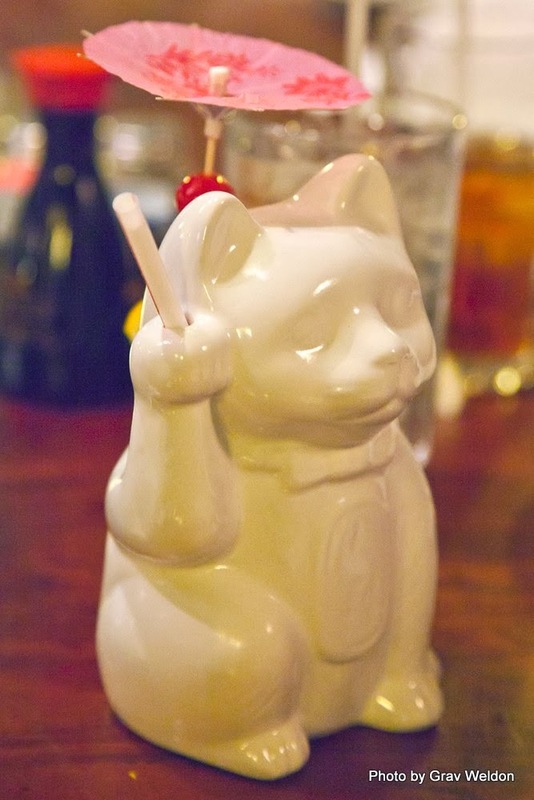 Our waiter came to take our drink orders, and I suggested the Neko to Grav, which he happily accepted. 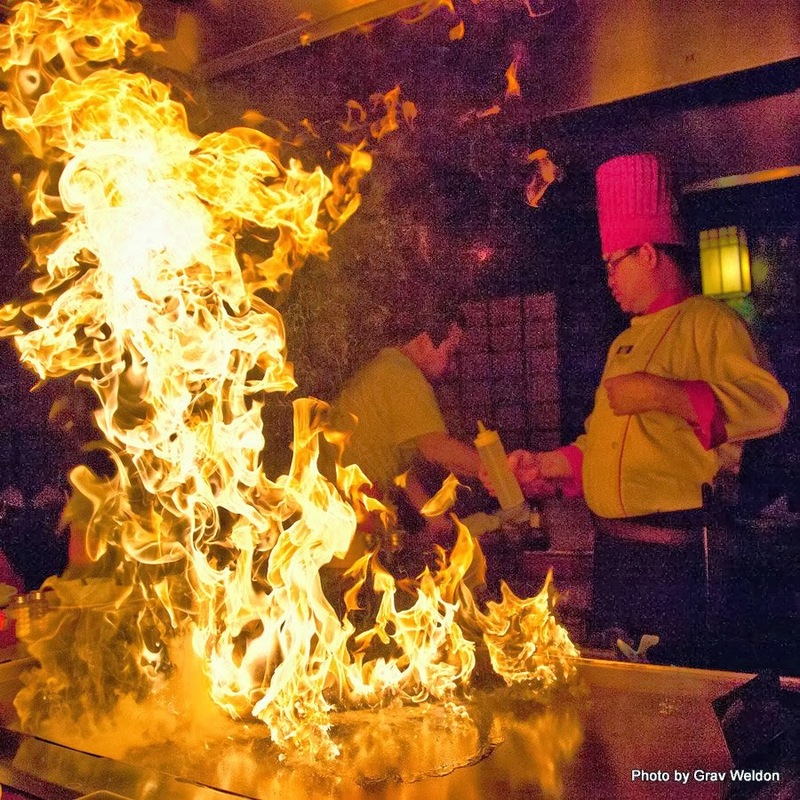 Hunter started claiming to dislike fire at this point, and I reminded her that her first solid food – a wad of wasabi, no less – was consumed in just such a restaurant. and to notice that one of the original gigantic artworks was still located in the long hallway between front and back. We amused ourselves with conversation and answered questions about our large cameras at the table. And we watched the preparations by the chef entertaining the other half of our area. I must admit, I was first disappointed at the arrival of beverages to see that Grav’s Neko had come in a plain daiquiri glass. I voiced this to the waiter, and he mentioned that the porcelain containers were an additional charge. Heck, we were celebrating a birthday here! We sent it back for proper cladding. 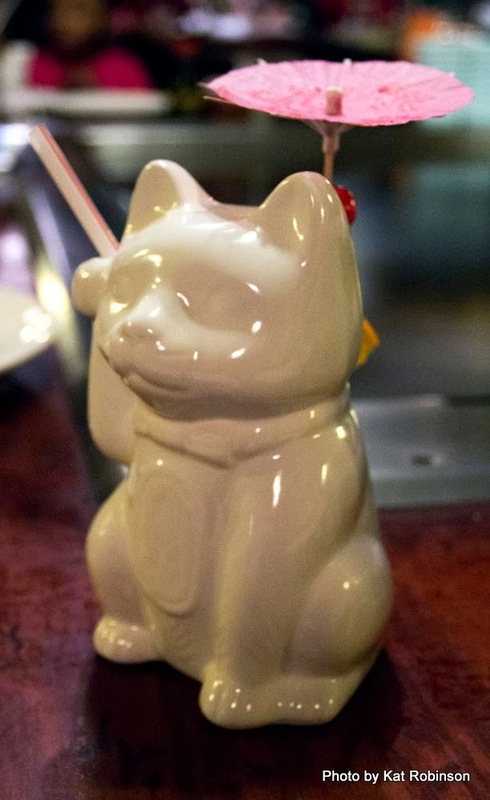 And when it was returned, here was our Neko, a gorgeous little cat full of Midori, peach schnapps and pineapple juice – a sweet treat of a mixed beverage. 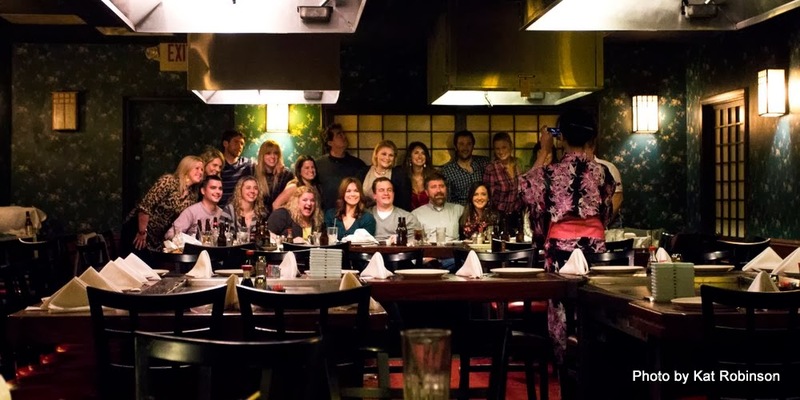 And the drums went off again, as the quintet of kimonos and chef’s coats breezed by again, this time with two pineapple boats for the two individuals celebrating at our shared area’s other table. Seems there were a lot of birthdays going around in this room. Our orders were finally taken at this point, and the couple next to us both voiced concern at the stretched-out service. I don’t believe they’d been there before, and hadn’t expected the wait. It was… well, it was a bit long, 30 minutes from our seating til the orders were taken, and they’d been there longer than we had been. Other restaurants in the market, such as Kobe and Koto, were far quicker. Soup arrived. 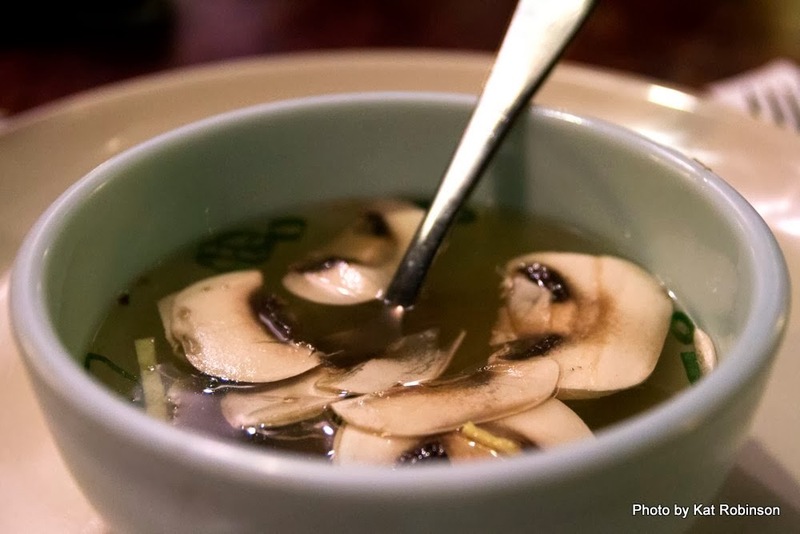 Listed as Mushroom Soup, this was simply the traditional miso-type soup topped with fresh slices of mushroom. Hunter’s recent aversion to mushrooms was noted, so I got her ‘shrooms. Grav’s suggestion of a dash of soy made it all the better. Best of all, it was warm – the room was a bit cool, thanks to the chilly weather outside and the draft coming from the grill vent overhead. And then the drums went off again, but this time for someone in the front room of the restaurant. Boy, were there a LOT of celebrations going on! We kept hearing the drums go off. We talked with the other families at our table, and watched as other groups came and went. 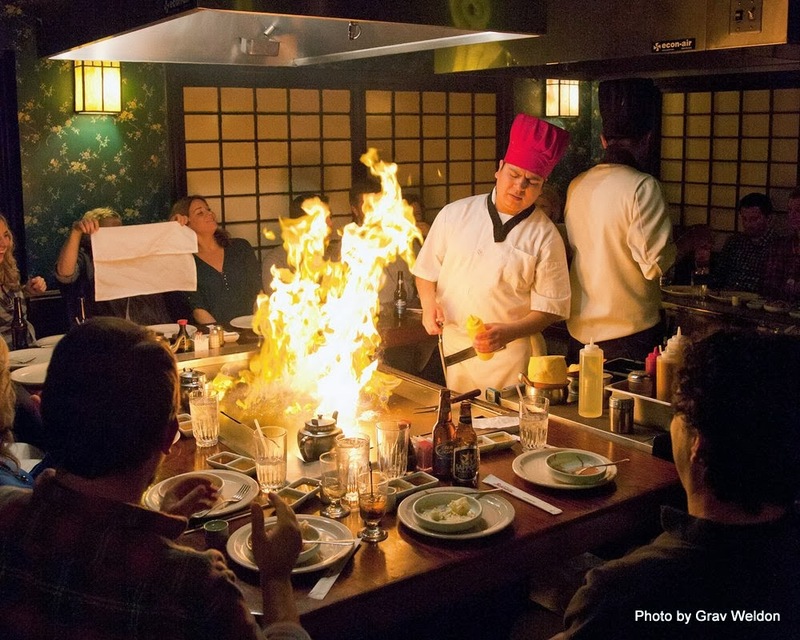 There were just three chefs on duty, and with each performance taking anywhere from 30 to 45 minutes, a wait was bound to be in order. Our chef came in his own time, and quickly got to work confirming our orders. 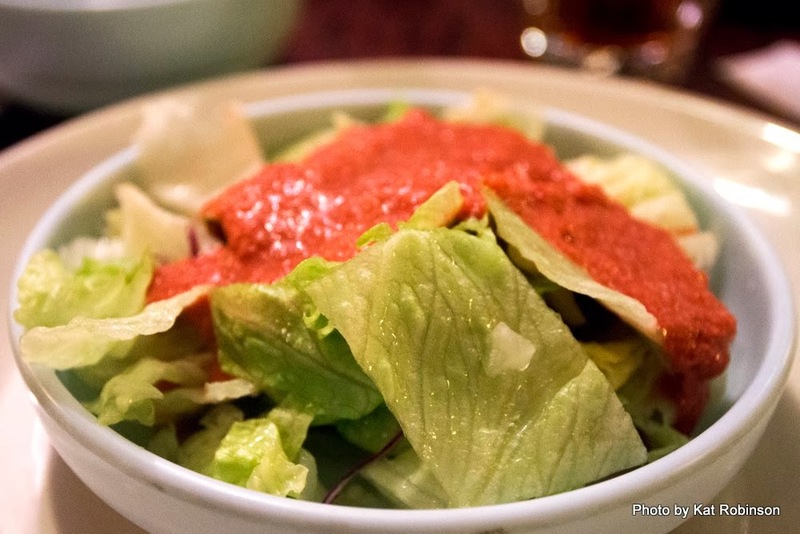 Our salads arrived simultaneously, big bowls of mostly iceberg lettuce topped with dressing. I had gone with the house ginger dressing and was glad for it, the deep salmon-colored topping just about right for what it topped. Grav went with Thousand Island and Hunter with ranch. We dabbled in our salads our chef got started. He began by swabbing down the griddle and then drawing a heart with oil, complete with an arrow through it. This he set afire, proclaiming “heartburn!” to the table, which awed some of the kids and made a few of the adults groan. 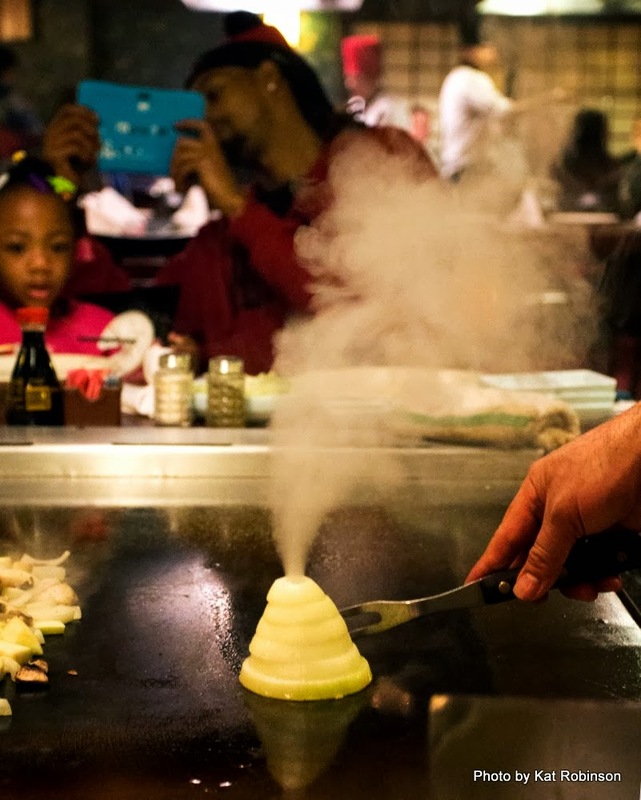 The roll of flame consumed the oil and the chef got to starting up with vegetables, expertly slicing and dicing through zucchini and mushrooms and onions. 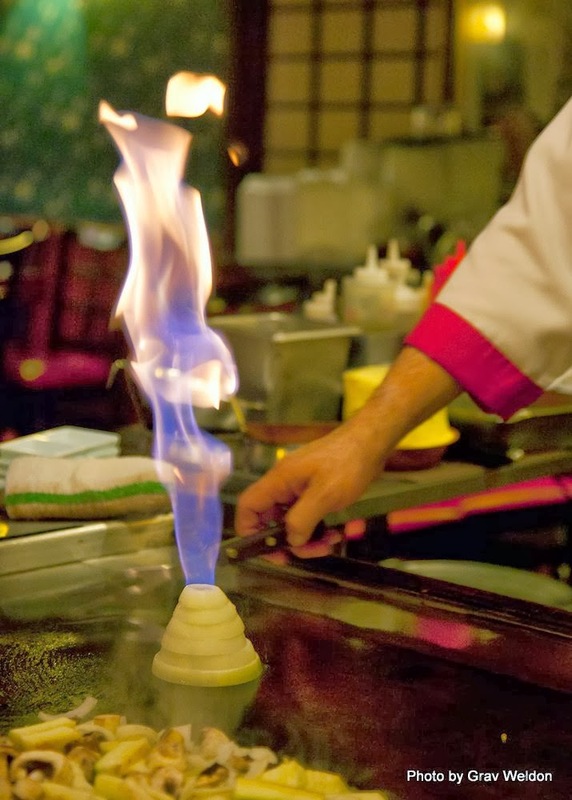 There was the creation of the flaming volcano, of course – rings of onion carefully separated and stacked, then filled with a little oil before ignition. 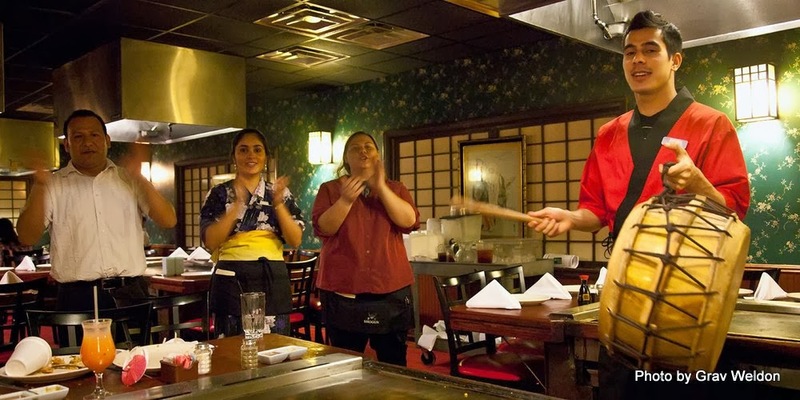 The clang of the dual spatulas of our chef rang out in his interpretation of a train. This isn’t somewhere you go if you’re not expecting to smell your food, or if you don’t care for a lot of noise. There was the cracking of eggs, then the heaping of rice upon them along with a mound of butter and then a dousing of soy sauce. Our chef cupped the fried rice into bowls before depositing them upon our plate. 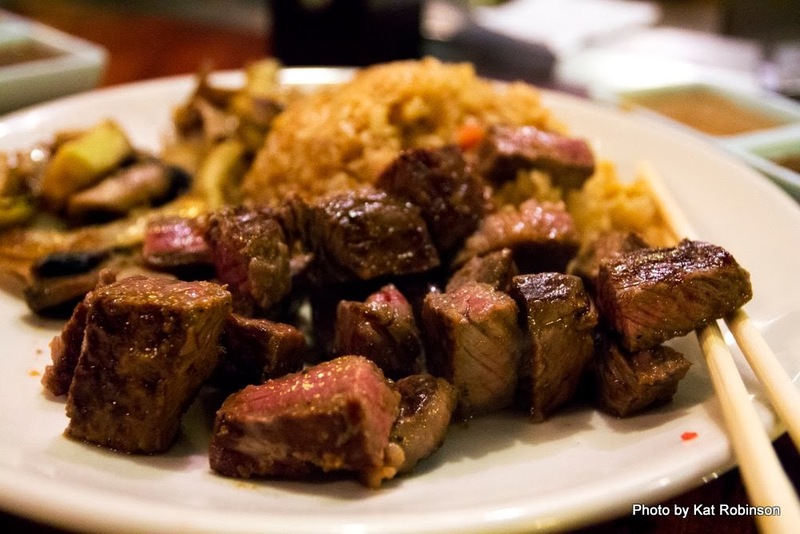 I was a bit surprised to see that my daughter’s child-sized beef order came with the same amount of rice as my Geisha Special (beef and chicken) and Grav’s King Sized Steak. The vegetables were completed and shared out to all diners, and then the real cooking began. I was asked how done I wanted my steak, as were the other steak-eaters at the table – and then chicken (accompanied by chef clucking) and steaks were plopped onto the hot surface. 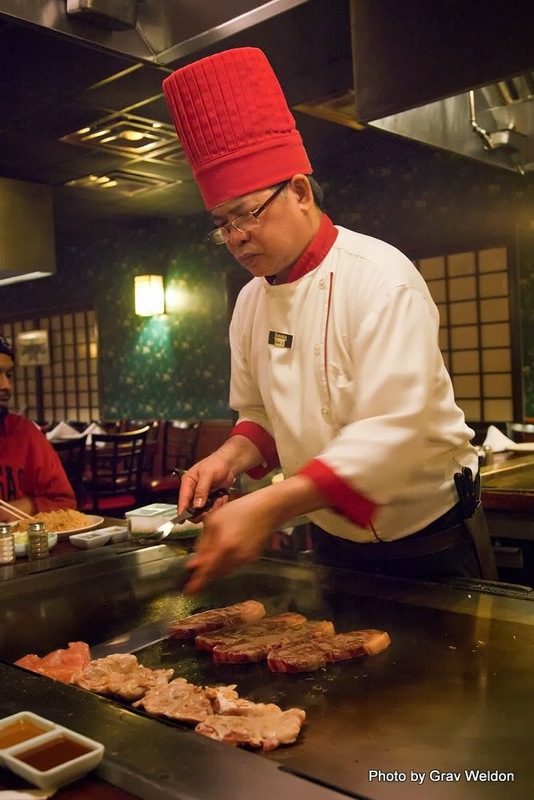 The chef sliced each steak, seasoned it and slid it from spatula to plates effortlessly – which reminds me – Shogun’s not the place for you if you don’t like your foods to touch. 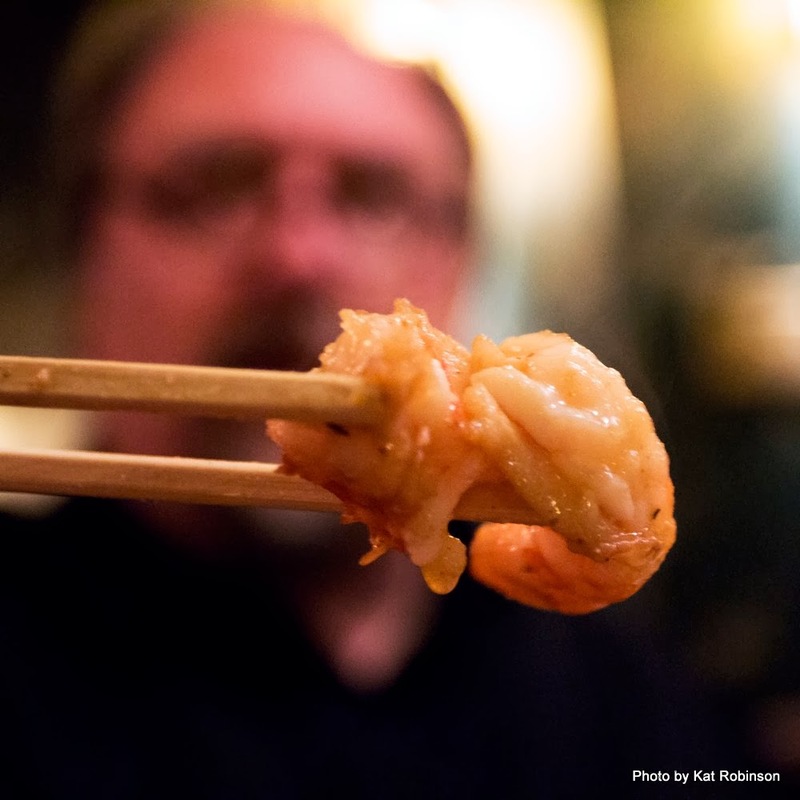 Shrimp were pulled out, dropped on the griddle, seasoned with soy sauce and a salt-and-pepper blend and lemon juice, quickly fried and shared out (the shrimp “appetizer” from the menu). Chicken was similarly shared. And soon the chef was cleaning the griddle top as we consumed our meals. And here went the drums again. It seemed odd, just how many people were being feted this night. And still, they didn’t approach our table. In fact, Hunter had turned to me, declared her exhaustion and passed out against my side. We’d been there nearly two hours. Our take-home boxes arrived and were loaded – and the drums sounded again. 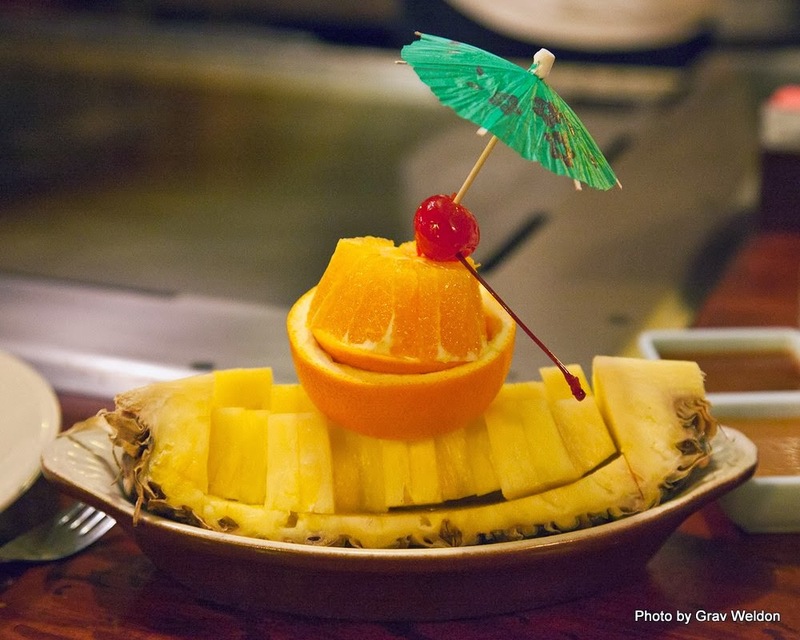 Pineapple boat at Shogun Japanese Steakhouse. And this time, they were for Grav. The quintet came forth with drum and song and a pineapple boat, and set it before the sleeping Hunter before being directed that today it was the 43-year-old celebrating another year. 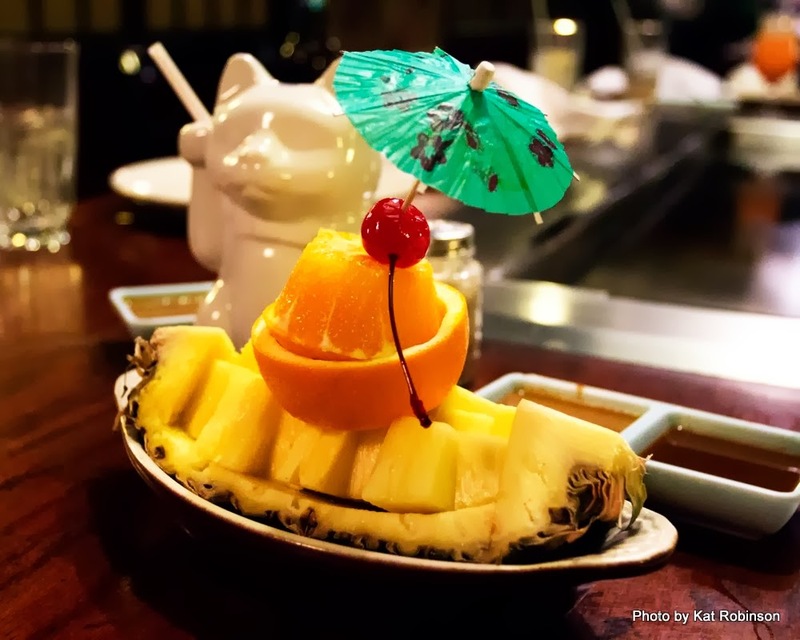 There were giggles and then they were gone, leaving behind a boat of fresh pineapple and orange with a parasol-stabbed cherry on top. Hunter never woke. She would tell me the next morning her disappointment in missing out, and I reminded her that we tried to bring her around, but she was done for the day. I even have photographic proof. 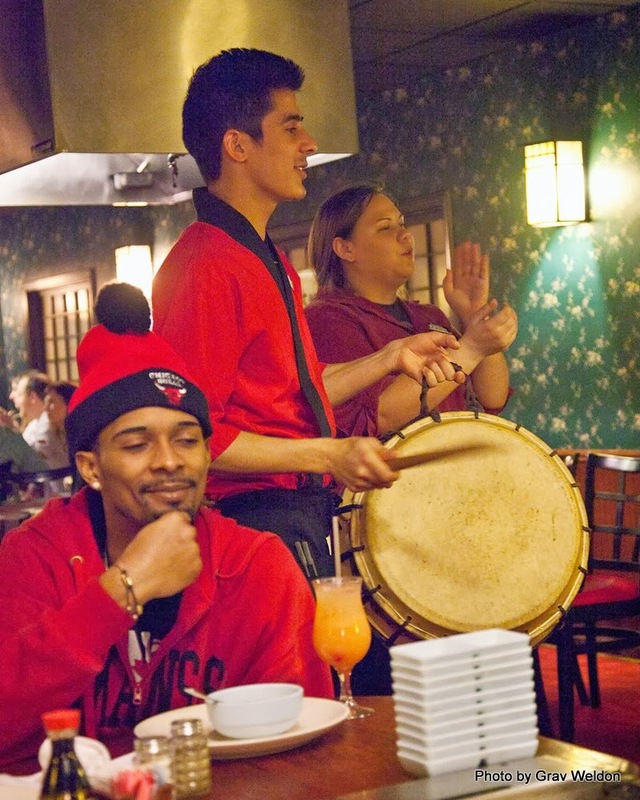 It wasn’t but a few minutes later that we heard drums AGAIN, as the drum progression marched over to the far table in the room – where one of the diners was celebrating a 31st birthday. Cheers went up all around, and a few minutes later the crowd posed for a photo. And we were on our way out the door. Mind you, this wasn’t a cheap feast – our total with tip came out over $100, far outside our normal dining budget. But we’d had entertainment and a good meal, and we were taking home a Neko cat for Grav to include amongst his many cat-themed possessions. 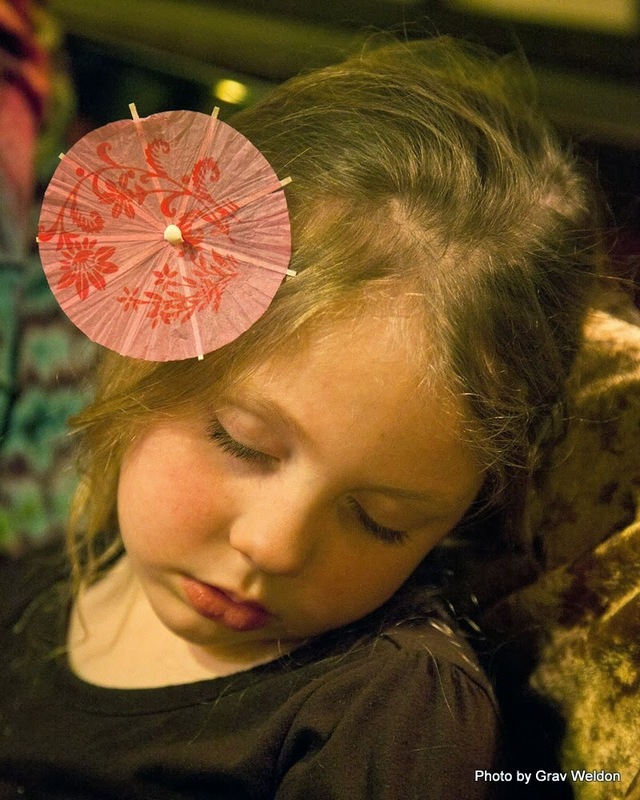 And my daughter now had a new set of neat memories, even despite falling asleep. 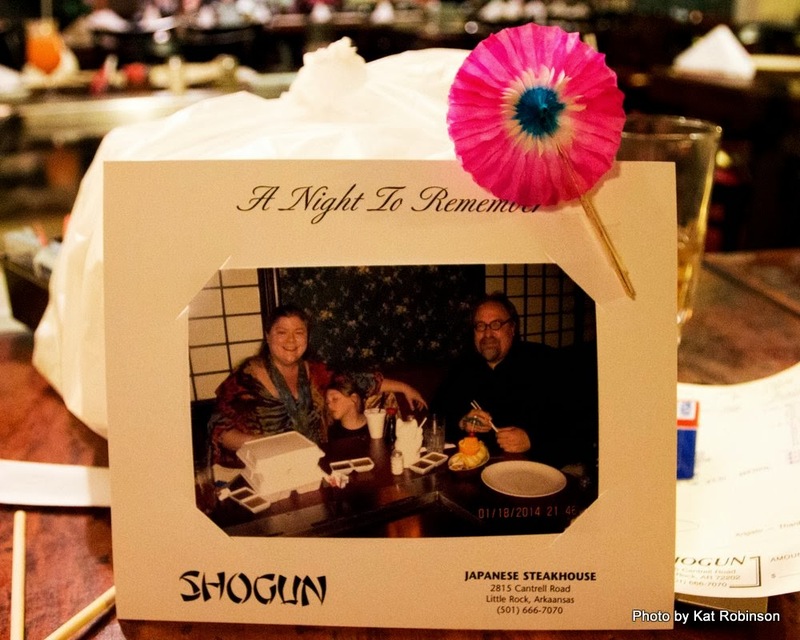 Shogun has been around about 32 years now, and while it might not be shiny and new and may lack in new tricks, it’s consistent and it’s apparently become a traditional place to celebrate birthdays. The packed parking lot showed me that the popularity hasn’t waned much. I suspect it’ll be around for generations to come.